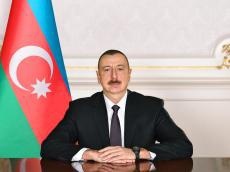 Azerbaijan's President Ilham Aliyev signed an order on Aug. 9 to establish the Organizing Committee in connection with holding the 43rd Session of the UNESCO World Heritage Committee in Baku in 2019. The Organizing Committee consists of its Chairman - Minister of Culture; members of the Committee - First Deputy Minister of Finance, First Deputy Minister of Transport, Communications and High Technologies, Deputy Foreign Minister, Deputy Interior Minister, Deputy Minister of Education, Deputy Minister of Youth and Sports, Deputy Minister of Health, Deputy Minister of Culture, Deputy Chairman of State Customs Committee, Deputy Head of State Security Service, Deputy Head of State Migration Service, Deputy Head of State Border Service, Chairman of State Agency for Public Service and Social Innovations. Among the members of the Committee are also Chairman of the Supervisory Board of the State Advertising Agency, Chairman of the Board of the Icherisheher State Historical and Architectural Reserve, Permanent Representative of Azerbaijan to UNESCO, Ambassador at Large of the Foreign Ministry of Azerbaijan, Secretary General of the National Commission for UNESCO, Deputy Head of the Executive Power of Baku, Chairman of the Board of the Azerbaijan State News Agency AZERTAC, Chairman of Azerbaijan Television and Radio Broadcasting CJSC, Vice-President of Azerbaijan Airlines CJSC, and First Deputy Director of the Heydar Aliyev Center.